Here is your ultimate travel guide to an incredible city that is just waiting for you to come and explore. With so much to see and do, you will never get bored here, and what’s more if you are a meat lover, this is your paradise. Buenos Aires boasts warm days and warm nights in May and June. This time of year is pleasant for strolling or biking around, and provides a great way to explore this vibrant, city. And by avoiding peak time, you are saving yourself money and hectic crowds. There is so much to see and do in this diverse city, head to the shopping district for some good old retail therapy, and make sure you go to a famous steak restaurant. We promise you it is worth it. Food and drink are often a highlight of any trip, so we have given top tips to the best eateries in the city. 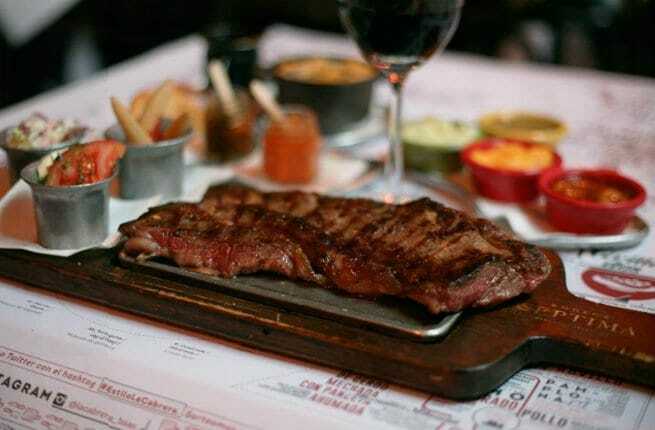 Travelers have long raved about Buenos Aires’s collection of European cafes and traditional parrillas, where you can find some of the best steaks in the world. Adventurous eaters rejoice. This famous eatery has been popular with locals and insiders for more than 10 years. What makes it so great? Simple, choosing the best cuts of Hereford and Aberdeen Angus beef, grilling them to perfection, and serving them alongside dozens of appealing sides like french fries topped with caramelized onions, hearts of palm salad, and provoleta, a crunchy-on-the-outside provolone cheese grilled in a small cast-iron pan. We know your mouth is watering right now, and we promise it is better than it sounds. Behind a cute flower shop and wine boutique is the subterranean Florería Atlántico, a friendly cocktail bar and restaurant, founded by two of the biggest names in drinks in Argentina, mixologist Tato Giovannoni and sommelier Julián Díaz. Since it opened in 2013, the hype is still going strong. If you love a delicious drink, the cocktail menu is a dream.